Nestled in the lush green hills of Ubud, the artistic heart of Bali, Kamandalu Resort and Spa is a five star boutique resort built in the traditional style of a real-life Balinese village with a touch of contemporary style. 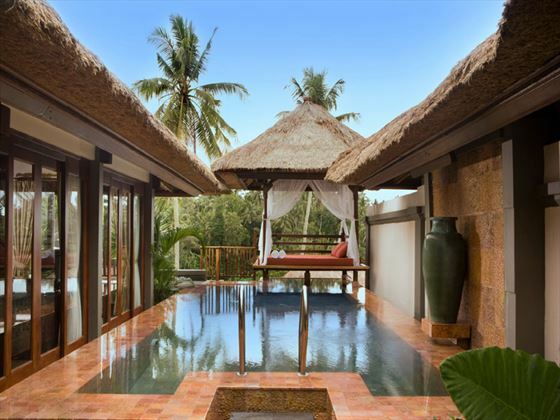 The exclusively all-villas accommodation blend harmoniously into the surrounding green terraced rice paddies and tropical forests. Kamandalu is located in the traditional and cultural centre of Bali, Ubud and is a must stay village whilst on holiday in this beautiful country. Located away from the bustle fo the village centre but providing regular shuttles throughout the day, this resort is a most welcome retreat. 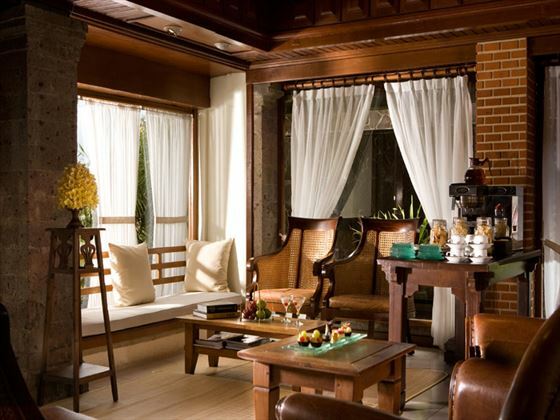 We like it because in good Balinese fashion they welcome everyone. 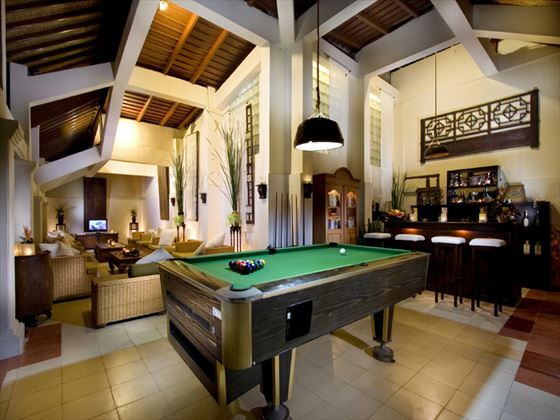 The ultimate for families is the private pool 2 bed villa. There are hideaways for honeymooners too and this is a great spot to get married. See our weddings programme for more details. This tranquil resort is set in the lush green hills of Ubud and is a short walk or 10-minute drive from the centre of Ubud. 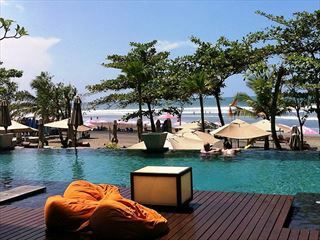 a 1-hour drive from Ngurah Rai International Airport. Featuring 80 square metres of beautifully-appointed living space, each villa is completely unique and individually designed. 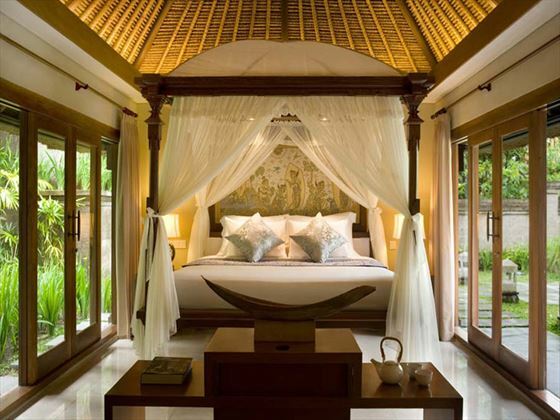 Selected villas feature views of the terraced rice paddies or tranquil lagoon, and you may choose from a king-size bed or twin beds. Accommodates up to two adults, or two adults and a child with one extra bed (additional charge). Appointed with a heightened level of private living space and a luxury selection of amenities, these gorgeous 129sqm villas are surrounded by breath-taking garden scenery. Accommodates up to two adults, or two adults and a child with one extra bed (additional charge). Nestled within a beautiful open-air lawn adorned in tropical flora, these incredible 180sqm villas comprise of a spacious master bedroom, luxurious bathroom and a private garden with a freeform pool and Bale Bengong; guests will also enjoy a selection of luxury amenities and exclusive access to the Village Club and its benefits. Accommodates up to two adults, or two adults and a child with one extra bed (additional charge). These sumptuous 300sqm enclosed hideaways offer magnificent vistas of Ubud’s terraced hillside from large glass windows and an infinity-edge private pool. Featuring a romantic, open-plan layout spread over a spacious master bedroom and fitted living room area, those who stay in these villas will be treated to exclusive Village Club privileges and amenities, including private check-in and butler service. Ideal for couples, this villa accommodates up to two adults, or two adults and a child with one extra bed (additional charge). Side-by-side, the two bedrooms in these 268sqm villas are each equipped with a private en-suite bathroom. 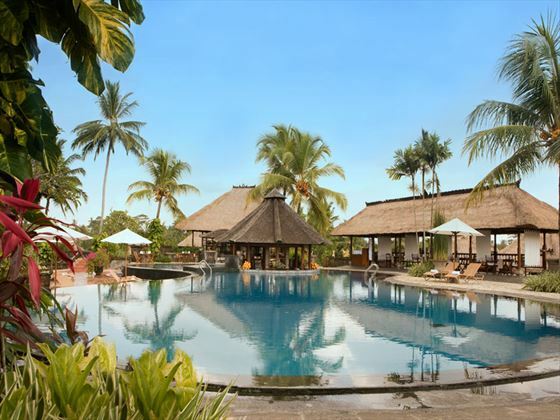 Featuring stunning valley views of luscious palms, exotic flora and vibrant blossoms, the gorgeous private garden is equipped with a large freeform swimming pool, a convertible plaza for intimate al fresco dining and a thatched Balinese daybed. Accommodates up to four adults, or four adults and one child with an extra bed (additional charge). Facing a verdant tropical garden blossoming with colourful flora, these expansive 392sqm villas are equipped with two spacious bedrooms, each with a luxury en-suite bathroom, as well as a spacious indoor dining and living area, a private freeform swimming pool and exclusive club privileges. Accommodates up to four adults, or four adults and one child with an extra bed (additional charge). Surrounded by a large private swimming pool that faces over the dramatic scenery of the Ubud Valley, this expansive 338sqm three-bedroom hideaway is separated in to two sumptuously-appointed floors. On the second floor, one of the main bedrooms is equipped with a luxury outdoor Jacuzzi with breath-taking 180-degree views of the emerald valley plunge, and each bedroom has a separate en-suite bathroom featuring a lavish sunken tub and rainforest shower. In the garden, a plush daybed in the private courtyard is the perfect spot for stargazing, whilst a large indoor dining room and living room allow for the whole family or group to unwind with spectacular panoramic vistas. Accommodates up to six adults, no children below 12 years of age are permitted, nor are extra beds. 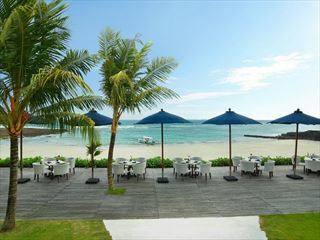 This charming open-air venue overlooks the sparkling main swimming pool and surrounding tropical scenery; specialising in casual meals and light refreshments, you can enjoy a selection of sumptuous Asian and western fare or barbequed specialities grilled to perfection throughout the day. In the evening, this dining experience promises a magical night under the star-studded sky. 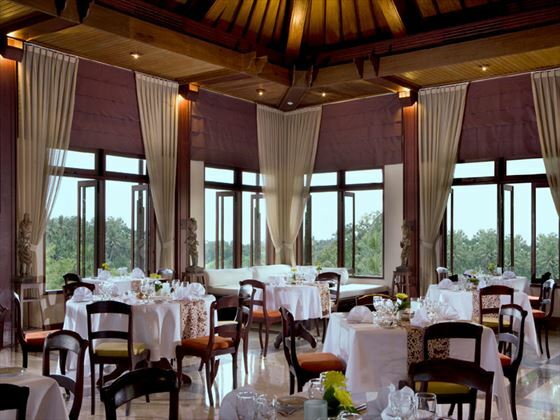 Featuring a majestic ceiling of polished timber and open-style windows, Petulu offers a refined dining environment serving a menu of authentic Indonesian cuisine with a selection of local and international wines. Delight in a romantic picnic lunch with views of the terraced rice paddies, or drift along the gentle waters of a lagoon in a tropical lagoon setting; you could even enjoy your delicious fare on the Tree Deck with tropical jungle vistas. Available from 12pm for two hours. The ultimate spot to chill out and indulge in a range of exotic drinks and healthy food whilst enjoying amazing views of Ubud’s serene tropical forest. Begin your day in the comfort of your private pool as your preferred breakfast selections are served, complete with a bottle of sparkling wine on a large floating tray. This is a wonderful experience for honeymooners and couples. Take pleasure in an exclusive dining experience served in the privacy of your own villa or by the pool. 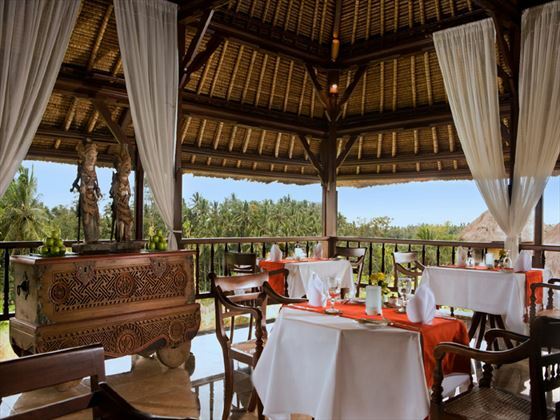 The resort’s culinary team will discreetly set up a table and serve a selection of traditional Balinese delights or Western favourites grilled especially to order. An extraordinary dining experience for couples seeking some intimate time alone together, Tipi is a romantic venue set up for candlelit dinners in a lush garden environment canopied by tropical blossoms and flora. An unobtrusive waiter will serve dinner, and then tactfully disappear for the rest of the evening to leave the two of you in peace. Available from 6pm to 10:30pm. For an intimate evening under the stars with flickering candles to set the mood, the chef will create an exquisite six-course dinner of gourmet excellence. This is the perfect opportunity for guests to celebrate the spirit of love in the timeless ambience of Alun-Alun. When the sun sets upon this jungle, there is a table for two awaiting the two of you. Savour a mouth-watering six-course dinner at the edge of a tropical forest, accompanied by the twinkling stars and the gentle serenade of the river waters. This is an evening to remember and cherish. Take delight in a romantic flower bath for two in the comfort of your own private villa, paired with a glass of sparkling wine and a selection of delectable canapes as you unwind in the soft glow of candlelight; a luxurious experience and the perfect way to unwind together after a busy day of Ubud sightseeing. Elephant Safari Adventure- Touch, feed and ride the Sumatran elephants during the day or under the stars. Watch the trained elephants show and explore the elephant museum. Buggy or Quad Adventure - A single or tandem 4-wheeled buggy or 3-wheeled quad ride along the up and down off-road hills and ricepaddies. Canyon Tubing Adventure- Pass through the wooden bridge, grab the flying-fox, ride the rubber boat and go tubing along the river. We are delighted that this resort welcomes children as much as it does adults. For kids this will be a resort to remember. A great pool and if you can stretch it, they can have their own pool. Honeymooner's are required to produce a copy of a valid Wedding Certificate on booking and check-in. 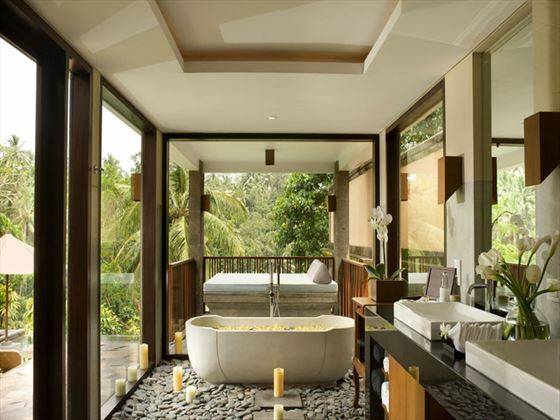 Anantara’s all-suite Bali resort at Seminyak offers a distinctly contemporary design approach blended with Balinese and Indonesian culture, ocean views, expansive balconies and Anantara’s inimitable Jacuzzi terrazzo bath tubs big enough for two. Our own little secret and what a gem. 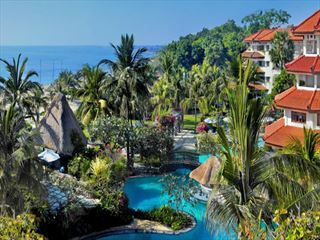 Tucked away far from the madding crowds is The Candi Beach Resort & Spa. Think lovely pools, gorgeous lawns with oodles of space, a non crowded sea and far reaching island views.